This particular Apple I was originally built by Steve Jobs and Steve Wozniak, of which only 60 to 70 remain — most of which are in non-working condition. Jobs and Wozniak built a total of 200 Apple I computers starting in 1976, selling 175 for an initial price of $666.66 without power supply, display, keyboard or housing. Apple I expert Corey Cohen restored the machine to original working order in June. Like other examples recently sold at auction, the RR Auction lot has no modifications to the original board, while the prototype area is described as clean and unused. Apple I was conceived to be sold as a kit, assembled post-purchase by hobbyists and tinkerers at home. Additional Apple-related items sold at the auction include a Macintosh Plus Computer signed by Jobs and the additional nine team members for $28,750, as well as an Annual Report signed by Steve Jobs that went for $23,750. 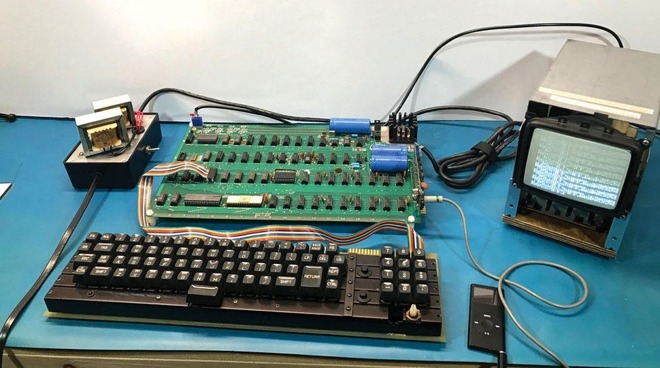 Widely viewed as the precursor to modern consumer computers, and an important piece of Apple history, Apple I has drawn sky high bids in previous auctions. In 2014, a working example sold for $905,000, while another went for $365,000 a couple months later. More recently, Charitybuzz in 2016 sold an Apple I complete with documentation, period-correct power supply and cassette interface card with early Apple Basic cassette for $815,000.